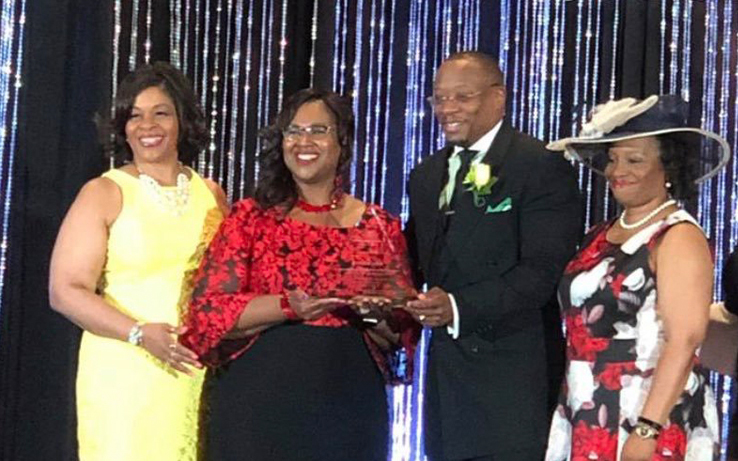 This past weekend, Houston Independent School District (HISD) Interim Superintendent Dr. Grenita Lathan received the Audrey H. Lawson IMPACT Award from Houston’s historic Wheeler Avenue Baptist Church, at their annual scholarship luncheon and fashion show held at the Hilton Americas in downtown Houston. Dr. Lathan was among six community leaders selected for having a significant impact on the local community. Other honorees included NASA’s Chief Education Officer Adena Williams Loston; Metropolitan Transit Authority General Counsel Cydonii Fairfax; NASA General Counsel Sumara Thompson-King; commercial and residential real estate broker Courtney Johnson Rose; and author and Pastor Mia K. Wright. The annual luncheon and fashion show is named for late community leader and activist Audrey Lawson, who was the wife of the founding pastor of Wheeler Avenue Baptist Church, Rev. William A. Lawson. An HISD middle school also bears Audrey Lawson’s name. The annual scholarship luncheon has already taken in a record $103,000 this year to assist local students achieve their higher education goals. The Honorary chairs of the event were business owners Richard and Aundrea Young.